Using just water, onewipe removes more grime, grease, dust and dirt faster than most traditional cloths and sponges-guaranteed! The advanced onewipe fibers quickly clean dusty surfaces in your home. 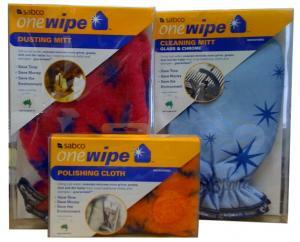 They are perfect for cleaning furniture, walls, mirrors and electrical appliances. The ultra strong fibers remove dirt and grime, whilst gently preserving the finish on all surfaces. Technologically advanced fibers grab, hold and carry away dust, dirt, grease and stains cutting cleaning time in half! Clean without using expensive chemicals. Re-use 100’s of times-just machine wash. Superior fibers and quality manufacture for long life. Doesn’t transfer germs and bacteria from place to place. Use an individually color coded onewipe cloth or mitt for each cleaning purpose and avoid the risk of cross contamination. Clean effectively without using harsh chemicals to keep yourself, your family and the environment safe, fresh and clean.